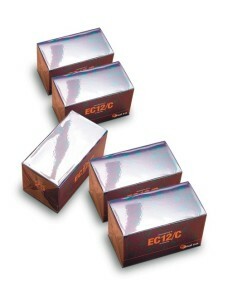 This reliable model has been specially developed for wrapping boxes with heat sealable materials. Economy, efficiency and versatility are the machine’s most remarkable features. 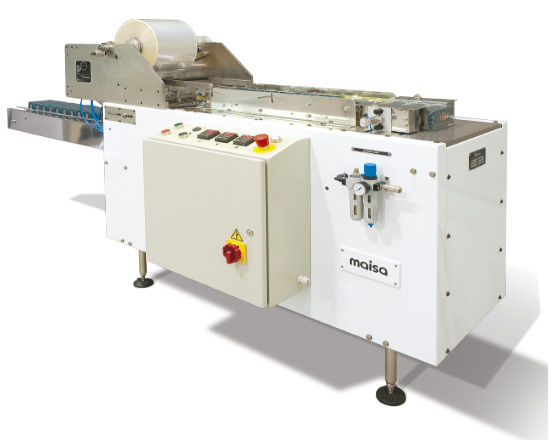 Because of its design, the Carton Wrapping Machine model RX20 is prepared to work with all the boxes produced by the MAISA line of packers and Cartoner AC8. 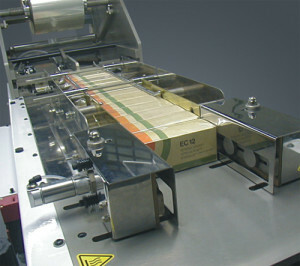 In a continuous and fully automatic process, boxes enter the system by means of a conveyor belt. 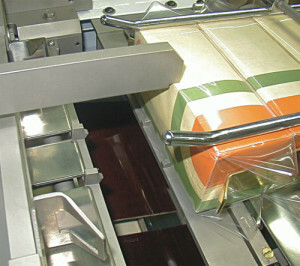 Inside the equipment, the boxes move towards the previously cut film and are covered. After a first fixing longitudinal sealing, boxes are directed to the final stage where, after folding, lateral sealers quickly complete the package. The RX20 works with the following wrapping materials (polypropylene, cellophane, PVC). 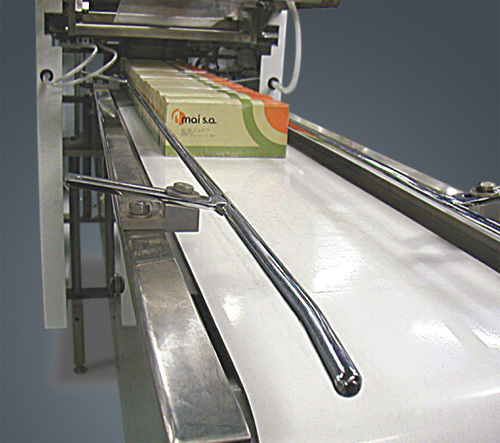 They should be capable of being folded without being brittle, they must be heat sealable and complete the sealing without corrugating its folds by the effects of heat. Thicknesses to be used range between 25 and 40 microns. The Carton Wrapping Machine model RX20 is prepared to wrap the most varied boxes of squared or rectangular faces that the market requires. 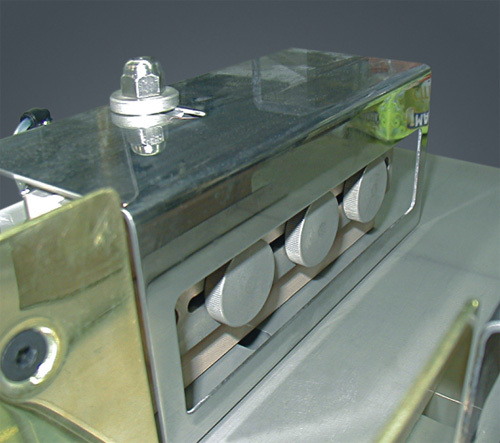 It has quick exchange pneumatic accesories that enable to transfer with simplicity from one presentation to another one. Length: between 90 mm and 200 mm. Width: between 50 mm and 180 mm. 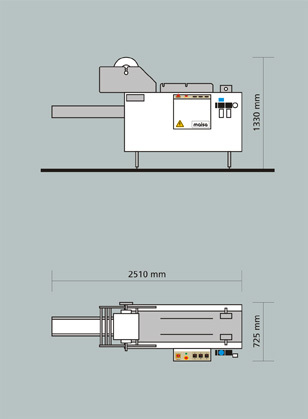 Height: between 60 mm and 75 mm. For boxes with dimensions outside these ranges, consult MAI S.A. 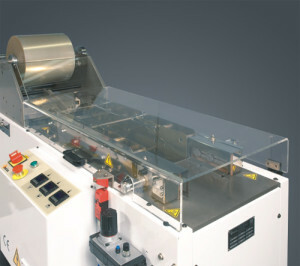 The wide RX20 enables to wrap boxes which size exceeds the capacity of the standard RX20. The working range is variable and we suggest you to consult Mai S.A. According to the customer’s request and attending to the needs of the market, we have model RX20-CE that fulfills all the requirements of the Rules applied by the European Community. 25 boxes per minute. 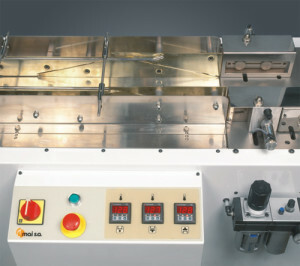 Output depends on the box size. Minimum: L: 60 mm x W: 52 mm x H: 58 mm. Maximum: L: 203 mm x W: 180 mm x H: 75 mm. For boxes with dimensions outside these ranges, consult MAI S.A.
200 l/min at 4 BAR. L: 1970 mm x W: 860 mm x H: 1450 mm.